If you love the look and beauty of hand lettering and want your Wedding invitations to have a distinctive look, please visit our boutique for a sample of our work. All calligraphy is done by hand (not computer generated) by the owner Cherie. If you love the look and beauty of hand lettering and want your Wedding invitations to have a distinctive look, please visit our boutique for a sample of our work. 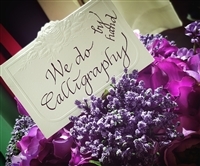 We also provide lettering for placecards. All calligraphy is done by hand (not computer generated) by the owner Cherie. This is a sample of my hand lettering that we use in our boutique. It is fancy but readable and looks very pretty. If you love the unique look and beauty of hand lettering and would like your Wedding envelopes addressed, please visit our boutique and I will be happy to provide a sample for you.